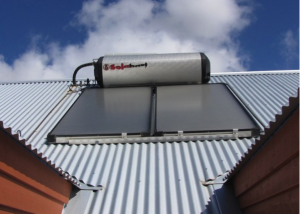 Solar Hot Water – Steady, Hot and Strong? Home > Uncategorized > Solar Hot Water – Steady, Hot and Strong? 18 Nov Solar Hot Water – Steady, Hot and Strong? The concept of harnessing the mighty power of the sun to provide energy for heating water is fantastic. Australians have embraced this green technology and no doubt this has been further encouraged by the government installation rebates that have assisted families in taking up the new technology without breaking the budget. Many new homes are now also fitted with solar hot water to assist in achieving energy compliance ratings. Solar hot water systems come in various shapes and sizes with different configurations for specific requirements. Solar systems are by their very nature somewhat complex in respect of design and installation method and this has become even more so in recent years as technology has developed in regards to options for boosting the system when there is insufficient solar energy available. In fact, to simply describe a hot water system as “solar” is ignoring the fact that all solar systems that are currently marketed in Australia require boosting from another heat sources, usually either natural gas, LPG or electricity. This additional heating is required to kick in during winter conditions, night time or during periods where normal demand outstrips the solar heating capacity. These components are required to be plumbed together in a compliant way – something which can sometimes be quite a process where many fundamental errors can be made. Due to the extreme temperatures that solar collectors can generate during summer months, the use of PEX plastic pipe is restricted in favour of copper. The solar collector panels need to be located at an optimal angle and orientation to the sun, as otherwise they will not function as intended or at least not to their full potential. Pipework requires appropriate lagging (i.e. insulation) in order to reduce heat transfer to the atmosphere and also to protect pipework from frost and impact damage. Copper pipework on the roof needs to be insulated from any contact with other metal roofing material as copper is not compatible and contact between dissimilar metals will cause electrolysis, resulting in early corrosion. If roof water is being collected for drinking purposes, the area which drains in and around the solar collector panels must be quarantined from the rainwater harvesting system (to avoid any risk of contamination from either copper oxide or glycol anti-freeze / anti-boil liquid solution). Solar collector panels not installed at the correct angle and/or orientation to the sun. Copper overflows and pipework fixed directly to metal roof sheeting without being insulated from contact. Inadequately lagged pipework with non UV stable lagging (i.e. insulation). Rainwater harvesting of roof areas surrounding the solar collectors and/or tank without being duly quarantined from potential contamination. Non-functioning solar panels due to a variety of reasons which results in a hot water system which is totally or almost entirely reliant on the gas or electric booster and this means high energy bills – particularly if LPG gas bottles are being utilised in country regions. In relation to the gas booster, these are often factory sized smaller than would normally be utilised on the house because they are only intended to act as a backup, secondary heat source to the system and literally have to ‘work overtime’ to try and keep up when the solar component fails. Inappropriate positioning of storage tanks at ground level which are nowhere near the most utilised hot water point in the house (i.e. the kitchen sink), which results in significant wastage of both energy and water – problems which again may be of increased significance in rural areas. The use of non-solar compliant pipework and fittings. Breaches of solar hot water system manufacturer’s installation guidelines. Dodgy roof flashings where pipes penetrate metal roof surfaces. Inappropriately sized systems for usage and/or geographical location. 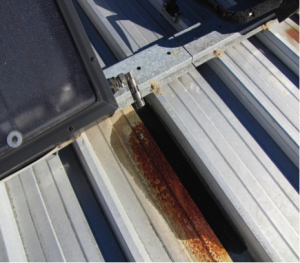 ABOVE: Shows copper pipes(arrowed) in direct contact with steel roof (L) and (R) severe rusting of a steel deck roof due to a leak from the solar collector pressure valve, further combined with incorrect fall on the roof sheeting (causing water pooling). 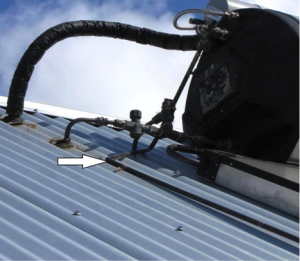 ABOVE: Shows a non-compliant solar collector system with various faults including no separation from rain water collection and copper piping in direct contact with the metal roofing material. A solar hot water system is a superb concept but if not appropriately designed, specified and installed, it can all go horribly wrong. If you have a solar hot water system at your house and yet you are experiencing excessively high energy bills, you almost undoubtedly have one or more of these outlined non-compliance issues to blame. Contact us today for an independent solar hot water plumbing health check – Metropolis is your plumbing expert for achieving solar hot water plumbing compliance!